The upcoming Femme Fatale collection is inspired by the 1990 movie The Witches, which makes this a perfect Halloween collection. Potion Polish just launched their Autumn collection not too long ago, and I'm here with my swatches. We get 5 gorgeous colors with equally gorgeous quality. 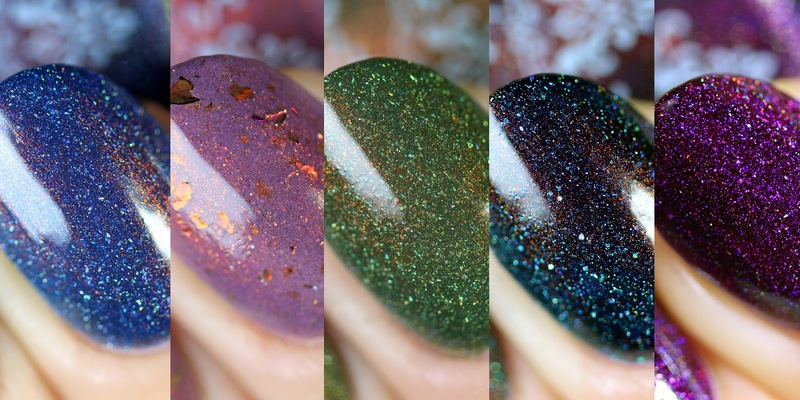 Today I have swatches of the new, October release from Emily de Molly. There are 8 shades in various finishes and colors, I'm sure everyone will find something to love. Live.Love.Polish has a brand new holo glitter collection that is inspired by the neighborhood of Williamsburg in New York City. I'm always waiting the new Live.Love.Polish creme shades with a big excitement, because they are always uniqe and gorgeous, plus the formulation is perfect. I made a whole bunch of comparison swatches, so you will have a better understanding for the shades. Most of these colors are those ones that could be looking warmer or colder depending on your skintone/lighting.